Dan Klores is a Peabody Award-winning filmmaker and playwright and the founder of Dan Klores Communications. Here’s his take on Linsanity. Roy Hobbs has come to Broadway in the form of a sound and sweet basketball player named Jeremy Lin. So much has been written about the Harvard-educated point guard that even the one-woman dating service Kim Kardashian has taken a backseat in the media. But as the Knicks try to replay ’69, we must pause for a moment to consider the tricky media problems that must be addressed with finesse and intellect. New York is — as any of the hundreds of big-time jocks who have failed here will attest — a tough place to focus. Lin’s adversary won’t just be the nightly grind of playing against one talented NBA point guard after another — or even the ongoing drama of “Mr. & Mrs. ‘Page Six’ Vasquez-Anthony” — but rather the deluge of media, TV bookers, editors, and slick “talent” agents who want a piece of him. No doubt, Letterman producers, masthead figurines from GQ and Men’s Journal, and folk from Good Morning America to Dateline will continue to solicit Madison Square Garden execs six times per day. Free advice, my friends: Just say no. The chore now is to protect this good-natured 23-year-old from fame. No better examples exist of the pitfalls for stars in Lin’s position than how badly the Mets and Jets handled David Wright and Mark Sanchez. Both got out to impressive on-field starts as toddlers in a tough town. Both are well-spoken, handsome, and young. Both had nice contracts and were single. But both started to listen to foolish “professionals” and became absurdly overexposed — showing up at Fashion Week, posing for covers of men’s, women’s, health, airline, and news magazines, and making “paid appearances” at everything from bar mitzvahs to corporate meetings. Within two years, their careers declined dramatically. Nobody is saying those guys shouldn’t have fun in New York — just look at Joe Willie, Clyde, and Jeter — but there’s a general principle at play here. Work hard and win before you fall prey to the seducers, the enablers, and the hucksters. Lin must be protected from those sharks — particularly the TV bookers and editors with a talent to entice. They have no shame, and offer goodies and treats straight out of the old record-promotion world. If they can’t close, they have extraordinary clean-up hitters named Barbara, Diane, and Dave who will pick up the phone themselves to lock the deal. The booker will send flowers to your mother, limos to your door, and baskets of food to your Aunt Alice. The booker will take your press agent to Michael’s, your manager to Daniel, your dad and his pals to Rao’s, and get you house seats to The Book of Mormon. The booker promises you they care: “Dave cares,” “Barbara cares” — and they do, about “the get,” not you. The booker is ambitious, focused, relentless, organized, and disciplined — all the things Jeremy Lin or any athlete needs in order to get better and to win. If I had to tell Lin something, it would be this: the money, the new contracts, the Q rating, the endorsements will all come. Now is the time to turn down all personal appearances and media requests. 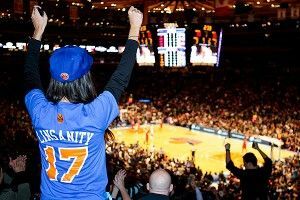 Serve the basketball fans in New York — the ones starving for a winner — and have fun (and make your money) after the season. To the Gardenistas: Protect this jewel. He’s good, he’s modest, and more than anything else, he’s real.